Cars were full of new games from people returning from Gen Con. We gave a couple new games a spin. Special thanks to our new visitor for showing up. Hope to see you on future Wednesdays. 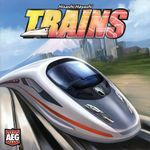 Jim scored this copy of trains from AEG. Fun games combines area controls and Dominion-style deck building mechanics. Progress building a train empire comes at a cost, pollution or waste. Kurt came prepared with a sleeved game. Fun game and expect it to become better in a campaign mode. Though it played a bit slow. Hopefully, experience will outcome the delays down the road. Players: Kurt, Barb, Jim, and Kevin. Winner: The adventurers in the last turn. Good classic game. However, play slower with 7 people. Bluffing and secret backstabbing. Never Get Involved in a Land War in Asia or go against a Sicilian when death is on the line. 8 district later a victor was declared. Players: Jim, John, Brian, Jacob, Kevin, (Kevin's girlfriend sorry I forget your name), and Kevin. Blood Bowl league seems to be going strong.